Opal Arlene (Carter) Nelson, age 95, of Mesa passed away on July 5, 2017. 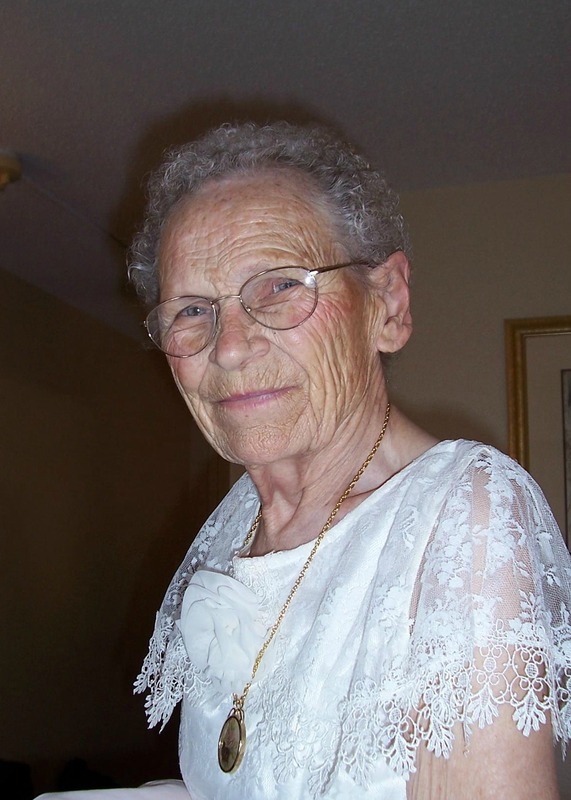 Opal was born January 12, 1922, in Wolsey, Beadle County, South Dakota. She was the daughter of Allen Bernard and Zada [Hickle] Carter. She attended elementary school in Beadle County and Grant County, SD. She also attended Brookings Agriculture School, Brookings, SD. Opal was united in marriage with Raymond Nelson on June 3, 1942, at the home of Francis and Verna Janssen near Strandburg, SD. Opal farmed with her husband near Round Lake near Gary, SD, until they moved to Lake Crystal, MN. They ran a Poultry business in Lake Crystal, until they retired and lived part of the year in Mesa, AZ. Raymond died on March 20, 1988. In her retirement years Opal did babysitting and caregiving. Opal was a faithful believer, and attended many churches in her lifetime where she did volunteer work and was an inspiration. In the last number of years she attended the Salvation Army Church. Left to cherish her memory are her children: Daniel and Linda Nelson of Good Thunder, MN; Mona and Megala (Karam) Megala of Mesa, AZ; four grandchildren: Timothy and Laurie Nelson of Minneapolis, MN, Mathew and Michelle Nelson of Sioux Falls, SD, Reamon Megala and Rida Megala of Mesa, AZ. She is also survived by her great-grandchildren; Jacob and Sara Nelson, Madison, Cohen, and Benton Nelson. Opal was preceded in death by her parents, her husband, her sisters, Verna Janssen and Norma Andresen and her brother, Conrad Carter. A memorial service will be held in honor of Opal’s life on Sunday, July 16, 2017, at 2 pm, at the Salvation Army Church located at 241 E. 6th Street, Mesa, AZ. Burial will be at the Woodland Hills Memorial Park Cemetery, Mankato, Minnesota. This obituary really presents how much she was an amazing person with all the activities and duties she did. Now she is in a good place. I remember Opal from when I was a little, little girl. She will be missed and thought of often. Love you aunt Mona! I am sorry for your loss. The death of a loved one is never an easy thing to cope with, no matter what their age. Perhaps you can find some comfort in knowing that Opal lived a long life and was able to experience things few ever will. You can also find comfort in knowing that you have the opportunity to see Opal again. The Bible states at John 5:28, 29, “Do not marvel at this, because the hour is coming in which all those in the memorial tombs will hear his voice and come out.” I hope this message is of some comfort. Opal was my mom’s aunt so I have known her since I was very young but really didn’t get to know her as a person until spending some time together after my wife and I moved to AZ in the early 90’s. She had a great sense of humor and an amazing faith. She was a truly genuine, good-natured person who loved to laugh but was never shy about letting a person know if their point of view varied from hers. It was always interesting to talk with her and hear her perspective. I am very sorry for your loss. Sweetest lady ever! She got her reward!!! Happy for her and sad for your loss! Cherish the memories! The world lost a Warrior Woman who used love and the question “Have you been born again?” many times. She’ll be missed. My sad thoughts at this time as I hear the news of Mrs. Opal Nelson going home to see Jesus. I do also have a lot of fond memories of Opal and Raymond Nelson when visiting their home in Lake Crystal. A couple that truly loved the Lord and it played out in every aspect of their lives. We will miss them here on this earth but look forward to the reunion in Heaven. God Bless your whole family at this time.